Meningitis is the inflammation of the meninges of the brain and spinal cord as a result of either bacteria, viral or fungal infection. Bacterial infections may be caused by Haemophilus influenzae type b, Neisseria meningitidis (meningococcal meningitis), and Streptococcus pneumoniae (pneumococcal meningitis). Those at greatest risk for this disease are infants between 6 and 12 months of age with most cases occurring between 1 month and 5 years of age. The most common route of infection is vascular dissemination from an infection in the nasopharynx or sinuses, or one implanted as a result of wounds, skull fracture, lumbar puncture, or surgical procedure. Viral (aseptic) meningitis is caused by a variety of viral agents and usually associated with measles, mumps, herpes, or enteritis. This form of meningitis is self-limiting and treated symptomatically for 3 to 10 days. Treatment includes hospitalization to differentiate between the two types of meningitis, isolation and management of symptoms, and prevention of complications. 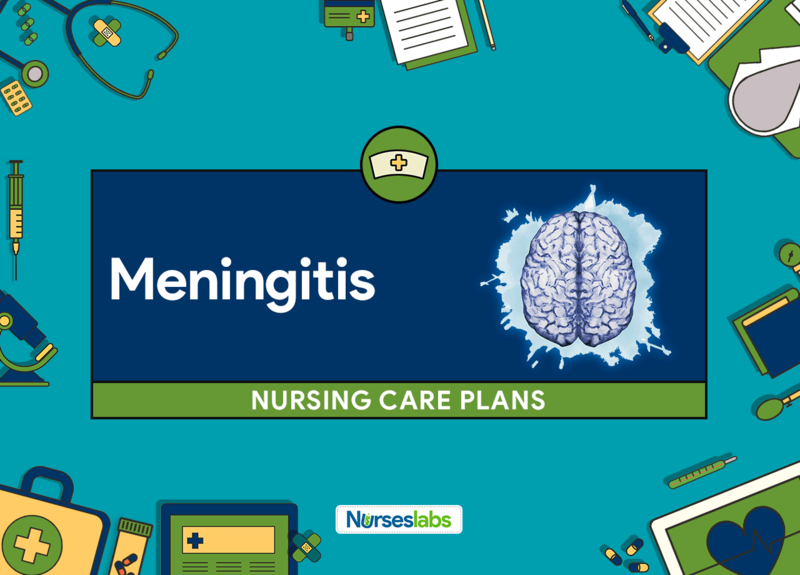 Nursing care plan goals for a child with meningitis include attain adequate cerebral tissue perfusion through reduction in ICP, maintain normal body temperature, protection against injury, enhance coping measures, accurate perception of environmental stimuli, restoring normal cognitive functions and prevention of complications. Child will have vital signs return to normal; child is alerted and oriented: motor, cognitive, and sensory function are within acceptable parameters for the child’s age; normal specific urine gravity. Monitor vital signs and neurological status. Increasing systolic blood pressure accompanied by decreasing diastolic blood pressure is an ominous sign of increased ICP. Observe for any signs of increased intracranial pressure. Signs and symptoms that indicate an increase in ICP include headache, drowsiness, decreased alertness, vomiting, bulging fontanelle (infants). Assess for nuchal rigidity, twitching, increased restlessness, and irritability. These are signs of meningeal irritation, which may happen because of infection. Observe for increasing restlessness, moaning, and guarding behaviors. These nonverbal cues may indicate increasing ICP or pain. Unrelieved pain can potentiate increased ICP. Monitor arterial blood gases (ABGs) and oxygen saturation. Determines presence of hypoxia and indicates therapy needs. Maintain head or neck in midline position, provide small pillow for support. Turning head to one side compresses the jugular veins and inhibits venous drainage, thereby increasing ICP. During reposition, avoid bending of the knee and pushing heels against the mattress. These activities increase intra-thoracic and intrabdominal pressures, thereby increasing ICP. Provide comfort measures and Decrease external stimuli such as quiet environment, soft voice, and gentle touch. Produces relaxing effect which decreases adverse physiologic response and promotes rest to maintain or lower ICP. Elevate the head of the bed 30°, and avoid neck flexion and hip flexion. Promotes venous drainage from head, thereby reducing cerebral congestion and edema and risk of increased ICP. Administer oxygen as needed. Reduces hypoxia which can increase blood volume, promotes cerebral vasodilation and elevate ICP. Used to control seizures related to increased intracranial pressure.